As a nursing student and new nurse you will be required to chart in the FDAR format (the is usually the charting standard in most healthcare facilities) . So, what is F-DAR charting? What are examples of FDAR charting? FDAR stands for Focus (F), Data (D), Action (A), and Response (R ). What is F-DAR charting and why it is used? It is a method of charting nurses use, along with other disciplines, to help focus on a specific patient problem, concern, or event. It is geared to save time and decrease duplicate charting. It is a great charting method for nurses who have a lot of patients and is easier read by other professionals. It gives other professionals a snapshot of what went on during your shift in a concise manner. It is used not only by nurses but other disciplines like nutritionists, occupational therapy, case management etc. Most health care settings are requiring disciplines to now document in the F-Dar format. Don’t forget to subscribe to my YouTube channel for more videos. What does FDAR charting look like? What does the FDAR stand for? D (Data): This is written in the narrative and contains only subjective (what they patient says and things that are not measurable) & objective data (what you assess/findings, vital signs and things that are measurable). This lays the supporting evidence for why you are writing the note. You are letting the reader know “this is what the patient is saying and what I’m seeing”. 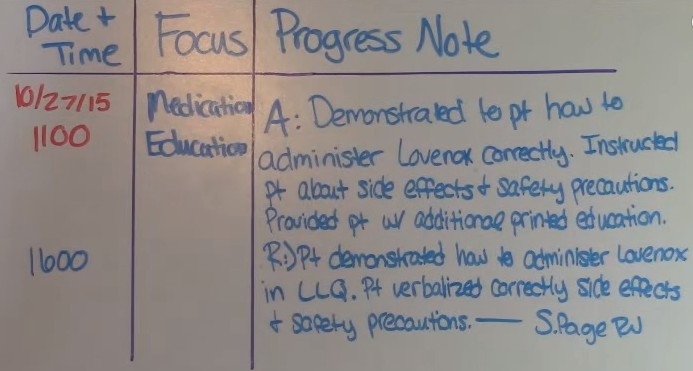 R (Response): This is where you write how the patient responded to your action. Sometimes, you won’t chart the response for several minutes or hours later. Example 1: This is what it would look like if you are charting a DAR format and the response is written later. Note how the note was first written at 1100 and the response was written later at 1145. Example 3: In this example, I show how you can chart just a D (Data). This is used for when you don’t have a flow sheet to document something like a transfer, procedure, admission, or something to the equivalent that needs to be charted. 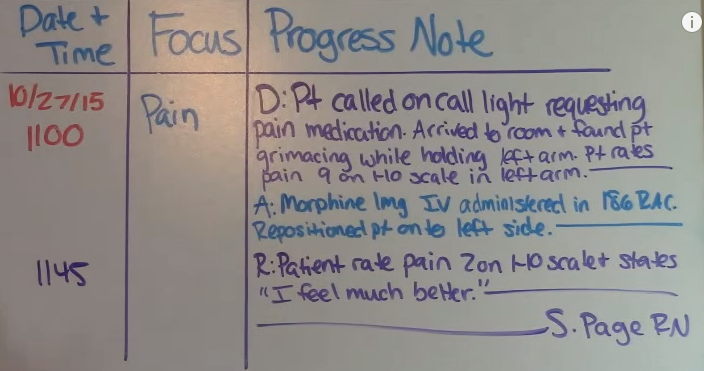 For instances, say you received a patient back from a thoracentesis and there is no flow sheet for you to document about receiving the patient back from the procedure, here is how you could chart it. Example 4: In this example, I show how you could chart by starting with Action (A) and Response (R ). 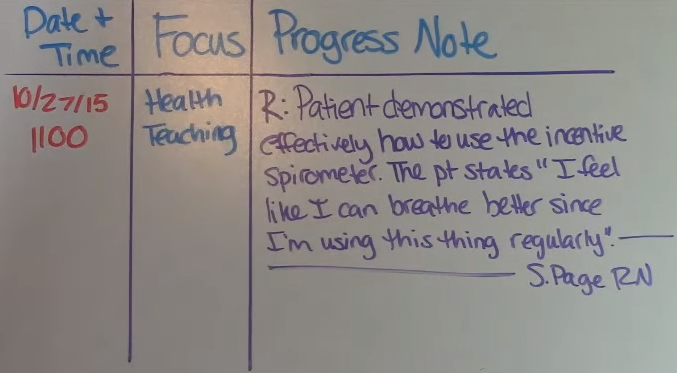 You would do this if it is unnecessary to repeat the objective and subjective data and/or your interaction with the patient began with an action. For example, this is what you would use for discharge teaching or patient education. Note how the response was written later (at 1600) when the patient actually demonstrated the injection. F-DAR is a concise and easy what of charting. It takes some practice to the get use to and I highly encourage that during clinical and orientation time you take ample time to practice charting.